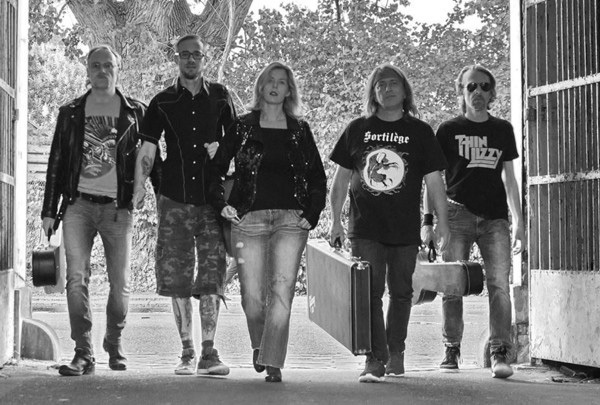 Here's Steel Inferno, a new band with a female lead vocalist rising out of Copenhagen with a multinational cast from France, Poland and Denmark. In 2014, they cut a demo cassette and later offered a 7" single. This year they deliver their first full-length album, Aesthetics Of Decay, on France's Inferno Records. Steel Inferno's sound is a time warp back to Eighties traditional heavy metal, leaning heavily to the side of speed and thrash metal. Typical of the genre, Steel Inferno works with twin guitar harmony and riffs. Yet theses riffs are best described as razor sharp and raging. With little doubt they dominate the Steel Inferno sound. After that it's the pummeling and punishing rhythm section. Both guitars and the rhythm section, when combined with the thrashy speed, are rather relentless. They definitely run over Karen Collatz' vocal performance. You can hear her, but she's taking a beating. With all these things combined, what Steel Inferno offers is both predictable and redundant. Once you've listened to the first several songs, you've basically listened to the entire album. I found myself wishing for some modicum of variation and moderation but, alas, it was not to be found. And so, the end result is that there's nothing all that memorable about this album. Nevertheless, if you like what I've described, raging razor sharp speedy thrash metal, you will probably like this album. 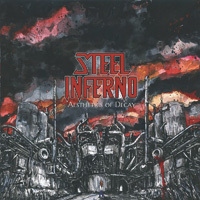 What Steel Inferno offers with Aesthetics Of Decay is both predictable and redundant. Once you've listened to the first several songs, you've basically listened to the entire album. Nevertheless, if you like raging razor sharp speedy thrash metal, you will probably like this album.